Das Taschenmesser der Raummakustik. DIRAC LIVE mit HDMI Einganmg/ Ausgang. Achtung: Lieferung ohne Mikrophon UMIK-1, was Sie aber auch bei uns kaufen können. The miniDSP nanoAVR DL integrates the world-renowned Dirac Live® room correction algorithm into a palm-sized HDMI audio processor. 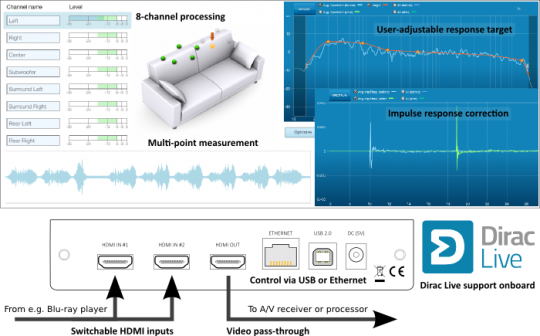 The onboard floating-point SHARC processor allows complete frequency and phase correction of a 7.1 home theater or multichannel audio system. The results from deploying Dirac Live® are remarkable: improved imaging and soundstage; greater clarity of vocals and dialog; smoother and more impactful bass; heightened realism. Last but not least, our free Android App provide live control of basic settings such as volume/mute/presets. An all in one control remote from your tablet/phone. Simply put: a better home theater experience! NOTE: The nanoAVR DL requires a UMIK-1 to perform measurements of the room. Make sure to add it to your selection if you don't already own one. - Requires a UMIK-1 to perform the measurements. Free Android App for control System requirements# Mac OS X Microsoft• ® Windows® Vista® SP1/ XP pro SP2/Win7/Win8: Intel Pentium III or later processor, AMD Athlon XP or later (SSE required) 2 Gigabytes (GB) of RAM or higher Two USB 2.0 ports Administrative permissions for software installation Product downloads nanoAVR DL Product Brief nanoAVR DL User Manual Techdata and app notes Dirac Live - Technical description On Room Correction and Equalization of Sound Systems License activation The Dirac Live® license must be activated after purchase. Activate here.